Simply stated; the Buffalo Bulls are rolling. A squad that had already looked impressive through a gritty non conference schedule, has now opened Mid American play at a program best 5-0. While the undefeated slate is catching eyes of college hoop junkies around the country, it is the margin of victory that is most intriguing. Buffalo has won it’s first five conference games by an average of 19 points per meeting; encouraging for the Western New York crowd because the MAC is a tough place to live. Why are the Bulls finding this amount of success? BALANCE. In recent years, there’s been some high-level players to come through Alumni Arena which has lead to program notoriety. Now there are legitimate conversations picking up about this team being the best all-around group in these recent years. As the season has developed, its seems that a combination of key experienced additions along with guys embracing a role fills a roster that Bulls Head Coach Nate Oats can confidently put out to run with the best. Junior guard CJ Massinburg set the tone early in the non conference months. He has been a relentless scorer since the day he set foot in Amherst NY but has patiently waited a couple seasons to assertively take the backcourt reigns. Massinburg has consistently been a solid threat, however, through the graduation of other key guards, he now looks the most confident he ever has as a Bull – leading to his 18.6 ppg mark (good for 2nd in the MAC) along with grabbing 8 boards a game. Nick Perkins is the reigning MAC Sixth Man of the Year. It’s no shocker that his numbers have now jumped since the seemingly correct decision to get Perk back into that role upon the return to action of Ikenna Smart. After a career high-tying 26 pts earlier this week against NIU, the junior is averaging 18.3 points in the 8 games he’s come off the bench. This was a brilliant move by Oats and staff as it allows Perkins to take a couple minutes to let the game get into a flow and visualize where he can do his most damage. Perkins is a high energy guy who at times get a little too amped-up and so this also allows him to take a couple deep breaths before seeing game action. He is hitting threes off the trail or relocation movements and has vastly improved using his body when he catches back to basket down low. With his nice hands, speed and true big man power, Perkins is looking stellar and an early favorite to reclaim his MAC accolade. Wes Clark and Jeremy Harris are the two immediate impact new faces but it helps that both guys come in with good game experience. Clark, the Mizzou transfer, had not played a college game since Feb 2016 . Being almost two year wait, It was safe to assume that the hunger to get back on the floor was beyond measurable. The senior guard responded by obtaining MAC East Player of the Week honors within weeks of his debut as a Bull in mid December. It almost seems unfair that a solid team like Buffalo was able to insert a player with the high caliber of Clark just in time for conference play. Watching this group play, you can sense that the positive character of Clark is welcomed by his short term teammates and he as been accepted as less of a threat and more of a giant piece to a Championship puzzle. Harris has also taken his short time as a Bull by the horns. The current MAC East Player of the Week is tough to watch if not on your side. Listed at 6’7’’ it is the length that makes Harris a problem for oppositions on both sides of the court. His ability to extend over defenders and show off his wonderful stroke from the outside is fun, but what makes him exceptionally hard to guard is that he can also use his slender frame to find defensive gaps and get paint touches seemingly whenever he wants. That’s all offense. Defensibly, Harris is also no fun to match up with….again with the length, the junior college transfer gets his hands on tips and deflections all over the court. Buffalo has started a Blue Collar Award this season which is given to a player at the end of each game. It is a points system that tracks deflections, steals, blocks, rebounds, loose balls, floor dives and charges…. In other words; a whole lot of hustle plays. Jeremy Harris has taken the Blue Collar 3 of the last 4 games; embracing the role. Another reason for Nate Oats to be smiling just a bit right now; it’s not everyday that one of your most naturally talented young men is also one of your grittiest. There are a bunch of guys showing high level offense and Buffalo seems like they have a revolving turnstile of scorers but a key player as of late isn’t necessarily getting all of the credit. Davonta Jordan has been a defensive menace. He is exceptionally fast and often undersized (listed a generous 6’2) but fearless when often assigned the toughest task. Jordan finds himself trying to shut down some the most explosive offensive threats in the MAC- and trying is an understatement as of late. The MAC’s leading scorer Eugene German from NIU came into Alumni Arena averaging just under 20 per game earlier this week. German had 2 at half. However, it wasn’t the 2 points that were the most exciting thing on the Bulls stat sheet- it was the 6 attempts from German’s hands. Jordan made it extremely difficult for a prolific scorer in German to touch the rock and quite frankly, just kept the ball out of his hands. Every attempt seemed disruptive and under pressure. The first couple minutes were a heavy statement and while the Bulls had struggled to score in the first half, it was through the tenacious defence of Jordan that kept his squad in the dogfight. Sophomore, “Coco” is scoring about 6 more points on average per game and is just 7 assists short of matching his total from his freshman year at 73. There is excitement and chemistry on both sides of the court right now for Oats & CO. While averaging just over 90 points a game in MAC play, clearly scoring has not been an issue. 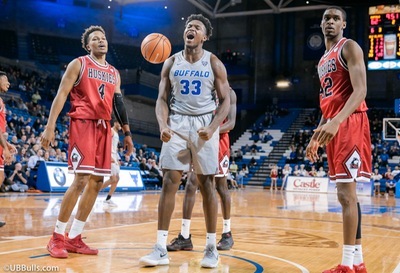 The defensive effort has also been commendable, especially because the Bulls have played their first five conference games without last season’s Mid American Conference Defensive Player of the Year in Dontay Caruthers. The junior guard has only seen 7 games this season after going out with a foot injury but is expected to return to action any game now. This might be a fantastic boost as the Bulls hit the road in some adverse conditions this weekend. Life on the road is tough- and probably more so when you are undefeated and feeling good. Tune into ESPNU at 7pm this Friday night, as Buffalo will travel to Kalamazoo, MI and face off with Western Michigan (3-2 MAC), the preseason pick to win the MAC West.